An interdisciplinary book entitled “Mathematical Stereochemistry” has been published by means of the combination of freely-available computer systems, i.e., the LATEX system for typesetting mathematical formulas and the XyMTEX system for drawing chemical structural formulas. Mathematical barriers and stereochemical barriers [2, Fig. 15.2]. This Figure is a revision of El-Basil's caricature [20, Fig. 35]. S. Fujita, TUGboat, 34, 325 (2013). S. Fujita, “Mathematical Stereochemistry”, De Gruyter, Berlin (2015). S. Fujita, “Symmetry and Combinatorial Enumeration in Chemistry”, Springer-Verlag, Berlin-Heidelberg (1991). S. Fujita, “LATEX for Chemists and Biochemists — A Guide for Writing Articles by Personal Computer” (in Japanese), Tokyo Kagaku Dojin, Tokyo (1993). S. Fujita, Comput. Chem., 18, 109 (1994). S. Fujita, TUGboat, 16, 80 (1995). S. Fujita, “XyMTEX—Typesetting Chemical Structural Formulas”, Addison-Wesley Japan, Tokyo (1997). S. Fujita and N. Tanaka, TUGboat, 21, 7 (2000). S. Fujita and N. Tanaka, TUGboat, 22, 285 (2001). S. Fujita, N. Tanaka, J. Chem. Inf. Comput. Sci., 39, 903 (1999). N. Tanaka and S. Fujita, J. Computer Aided Chem., 3, 37 (2002). S. Fujita, N. Tanaka, J. Chem. Inf. Comput. Sci., 39, 915 (1999). N. Tanaka, T. Ishimaru, and S. Fujita, J. Computer Aided Chem., 3, 81 (2002). S. Fujita, J. Comput. Chem. Jpn., 4, 69 (2005). S. Fujita, “Organic Chemistry of Photography”, Springer-Verlag, Berlin-Heidelberg (2004). S. Fujita, Asian J. TEX, 3, 89 (2009). 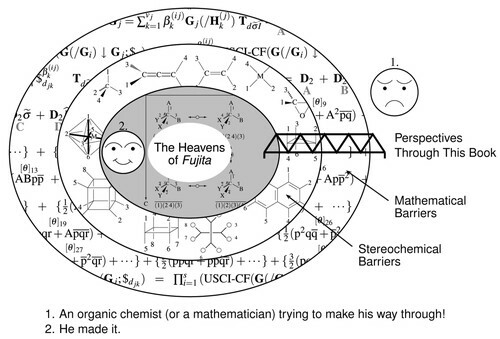 S. Fujita, “Diagrammatical Approach to Molecular Symmetry and Enumeration of Stereoisomers”, University of Kragujevac, Faculty of Science, Kragujevac (2007). S. Fujita, “Combinatorial Enumeration of Graphs, Three-Dimensional Structures, and Chemical Compounds”, University of Kragujevac, Faculty of Science, Kragujevac (2013). S. Fujita, “XyMTEX: Reliable Tool for Drawing Chemical Structural Formulas”, Shonan Institute of Chemoinformatics and Mathematical Chemistry, Kanagawa (2013), http://xymtex.com/fujitas3/xymtex/indexe.html. S. El-Basil, “Combinatorial Organic Chemistry: An Educational Approach”, Nova Science, Huntigton, New York (2000).